So August might have been National Hair Loss Month, but I’m covering it this month. #RebelStatus. The subject itself used to be rather taboo, especially for women. Not so much anymore, as it’s been quoted that 46 million women in the U.S. have already experienced thinning hair or balding. AND women who’ve had chemical treatments are 71% more likely to experience hair loss than those who haven’t. gulp. Not great news for us women who can’t pull of the cue ball look as well as men can. Cough Morris Chestnut cough cough. I’ve written about this topic before, so check out those suggestions if you like HERE. But if even more strands are coming out in the shower lately, make sure you know your options before considering an invasive procedure. First off, do you bun or pony your hair up often? Guilty. It’s no bueno for fine, fragile or damaged hair. If you’re going to continue doing it (guilty again), here are a few tips to at least lessen the damage you’re already doing. Apply a hair strengthener or leave-in conditioner after showering. The It’s a 10 restoring collection has some great, cost-effective options. Try the Miracle Leave-In Potion – or for styling, check out the Miracle Whipped balm. Love that one! Hair is most fragile when it’s wet. Try waiting ’til your hair is dry before pulling it or twisting it up. If time doesn’t allow, go for a clip vs. a band. Clips with “teeth” are easier on strands than clamp-style clips or rubber bands. If you want to try a hair collection that helps to regrow and restore your strands, I’ve been really impressed with the ReGenesis collection. It’s made by the Revitalash people. They’ve got awesome spot treatments and leave-ins, but I’ve been most surprised at the efficacy of their Scalp Therapy shampoo and conditioner. I highly recommend trying these! Another option people are swearing by is Keranique. 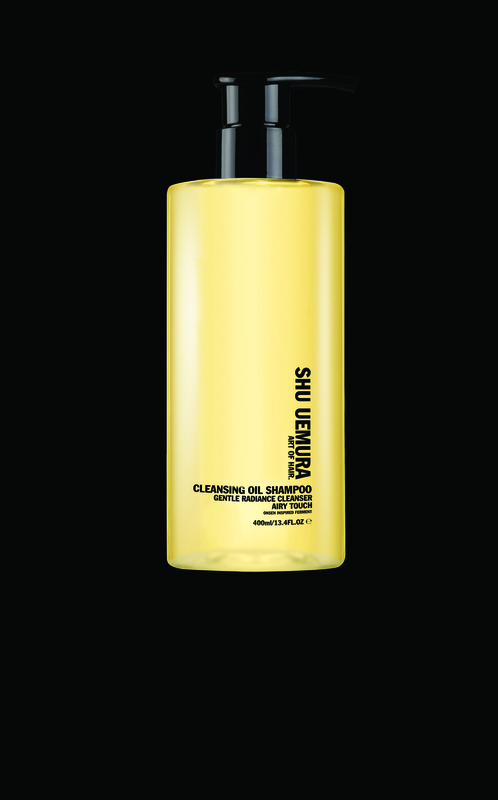 It’s a 4-piece system said to help rejuvenate your scalp and hair shafts. NOTE: I haven’t tried this one personally, but have heard good things! If any other products have worked for you, please share them here. And if you try any of the above, let me know what you think! Usually I babble on about makeup and skincare. Now I’m told I’ve been remiss in my hair care suggestions and discussion – or lack thereof. I don’t really have any excuse, save to say color products are more fun. In any case, I am not without my opinions on the subject. 1. Not only does Oscar Blandi’s Cleo de Jasmine oil serum help get rid of frizz, add life to dull hair and minimize fly-aways, but the scent is kinda intoxicating. You’ll only need one or two drops. Find it at Sephora. Just as we learned in kindergarten not to judge a book by its cover—don’t judge this salon by a certain receptionist. Once you get past the robe room, it’s smooth sailing. I saw Michael Petrelli for color, an absolute doll who truly wanted to make sure I left with my exact desired hue. For cut and style, it’s hard not to fall in love with the artistry of young Michele Finessi. He will tell it like it is, even if it means holding off a few weeks for a specific cut. 3. 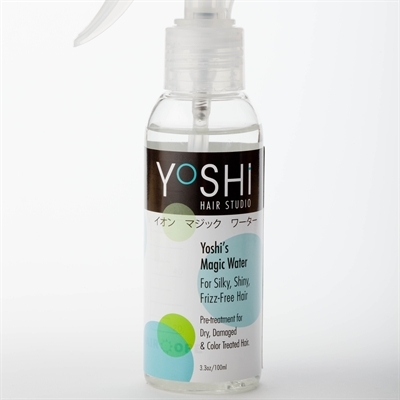 Say goodbye to dry and cranky weather-hair with Yoshi’s Magic Water. I don’t know what’s in this stuff, but it works! Just follow the directions or stop by Yoshi’s Beverly Hills studio and have him break it down for you. And hey, while you’re there, indulge in a cut or blowout. 4. Rita Hazan Root Concealer New York-based master hair colorist Rita Hazan has spent more than three years developing a root cover up spray that would stand up to her high 5th Avenue expectations. The Root Concealer is water-and sweat-resistant, plus won’t stain the face or bed linens. Available in a four different shades, we suggest going with the Blonde/Golden Blonde to mask those pesky grays. Exclusively at Sephora. 5. Justin Surh | Michael John Salon Go Beverly Hills old school-style with Justin Surh at the Michael John salon. Just don’t be swayed by the unimpressive salon itself – Justin in on his game. He’s known for his customized color, hair extensions and having an exceptional eye for serving up flattering cuts. Plus, in a city known for straightening and smoothing every tress, Justin is a total curly hair expert. 6. Shu Uemura Fiber Lift, Essence Absolue, Shu Uemura Cleansing Oil Shampoo…well, why don’t we just chalk #6 up to any of Mr. Uemura’s hair products… they’re all pretty addictive. 7. L’Oreal Paris Professionel Absolut Repair Expert—these are only sold in salons, so just ask for ‘em at your next appointment. There’s an Absolut treatment and cleanser for every type of mane. These are really great—and we’d have never known about the line if L’Oreal Paris hadn’t sent some over. So big thanks to the brand’s PR peeps. Good job!